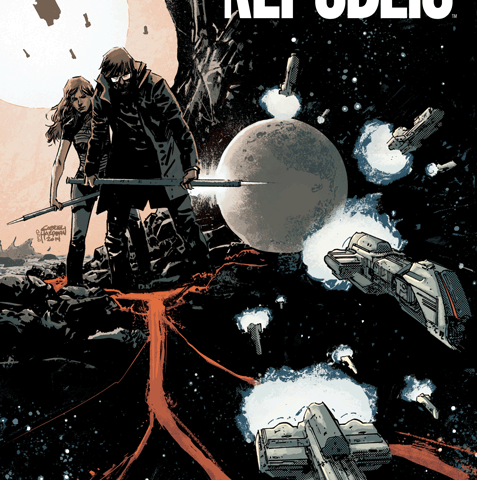 Invisible Republic’s solicitation that it’s “Breaking Bad meets Blade Runner” may not live up to its expectation for me quite yet, but it’s damn near close. 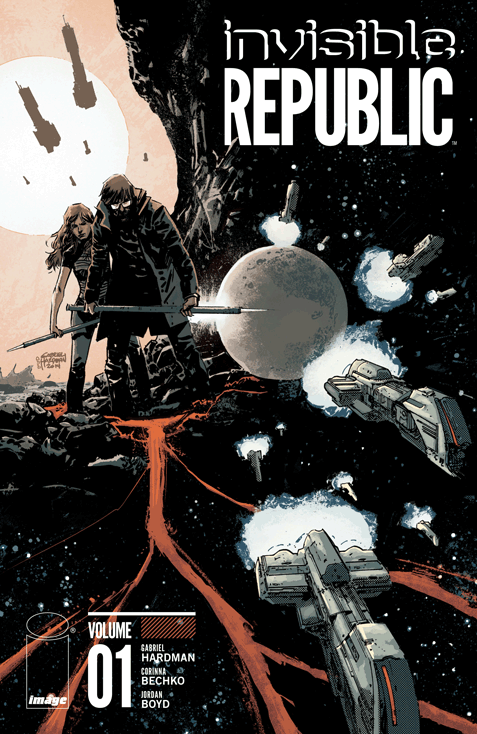 This new sci-fi series is another one of many science fiction futuristic near-apocalyptic titles out right now and it’s a front-runner for one of my favorites. Corinna Bechko and Gabriel Hardman deliver a solid series about the extraordinary and dangerous rise and fall of Arthur McBride. He’s far from a Ziggy Stardust and more like a Che Guevara turned Saddam Hussein with age after his totalitarian planetary regime crumbles. It’s now the year 2843 on Avalon in the Gliese System and everything is terrible. Looking for a good pull-quote for a serious article to get away from his bad writing days, in-your-face Earth reporter Croger Babb’s is on the streets bugging everyone about the recent collapse of the Malory regime only to rip off the story of a lifetime from an unsuspecting bum. What this now-homeless guy thinks was just kindling for his fire is the hottest and most complex story of Babb’s career—the remnants of an almost destroyed journal from Maia Reveron, none other than Arthur McBride’s cousin. Oh, my, does she have some interesting things to share. We time travel back with Maia in her own words back to 2801, the days before FTL, when this moon was still called Maidstone, and she and Arthur were newly escaped refugees. Once found on Bright Rock Beach by military forces who begin harassing them, one thing leads to another and violence breaks out, and soon boils over to revolution. In this same entry about her cousin brutally murdering the guards with her, she writes, “I thought I knew him and what he was capable of. I was wrong.” From here, the book only gets better and this moon’s story only gets more complicated. This is the story of power, government, love and journalism ethics (no, really). More than anything, this is about how history is written and, more importantly, who is the author? When you’ve got the story of a lifetime that changes everything everyone knows to be true, then what do you do? Do you end up being a hero for uncovering such a major revelation or will you end up like one of those characters on House Of Cards—which is to say, dead? Here we get two parallel narratives spliced together thematically and visually very well. We understand the significance of Babb’s find both for him personally and for the moon as a whole through the silent story-telling throughout each page. Bechko and Hardman jive extremely well together on this book and their passion for the art is evident in how seamlessly these two distinct stories work so well together. This volume dives into some cold and calculating waters: does a leader need to be cruel, and how publicly can a leader show that true face to the crowd? It’s a story set in a distant future that looks so bleakly like our past, which may be a statement about the cyclical nature of it all—everything turns out in greyscale to someone eventually. It is weird anachronistic to think that Avalon would still be using pen and paper so far out into the future, but maybe that’s a little presumptuous of me believing that the iPhone 6s will be 3d—as if.